UC Agriculture and Natural Resources marked the opening of a new conference and laboratory building at its Intermountain Research and Extension Center in Tulelake July 26, bringing to the region a state-of-the-art facility for business meetings, job fairs, trainings, conferences and community events. 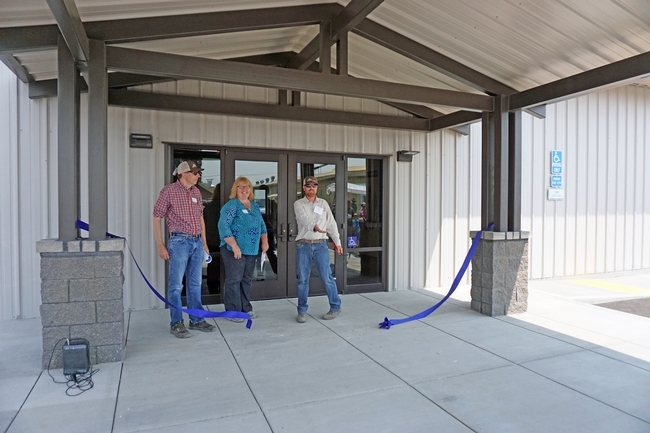 "The facility is the first in the Tulelake area to offer modern audio-visual infrastructure and high-speed internet connectivity capable of supporting remote presentations to stay in touch with groups from around the world," said Rob Wilson, IREC director. "We hope this facility will greatly increase the visibility and accessibility of local events and help draw more regional attention to the area." Left to right, UC ANR vice provost Mark Lagrimini, associate vice president Wendy Powers, and IREC director Rob Wilson took part in the ribbon cutting ceremony for the new IREC Multi-purpose Conference and Laboratory Building. UC ANR funded construction of the $2 million building. IREC is working with the community to complete the project with furnishings and equipment. 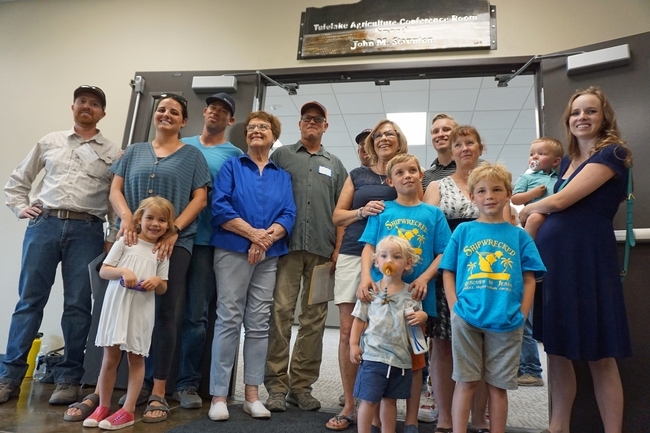 The Staunton farming family attended the building opening, where a conference room has been named for family patriarch John Staunton. The conference building opening followed the 2018 IREC field day, an annual event that showcases the research underway at the 140-acre facility. Research presentations included updates about work on biological control of cereal leaf beetle, influence of fall harvest management of irrigated grass hays, onion white rot, managing alfalfa weevil and clover root cucurlio, pulse crop options for the Klamath Basin, cover crops and amendments, cutting schedule effects on low lignin alfalfa and germplasm evaluation of alfalfa and tall fescue. Charlie Pickett, CDFA environmental scientist, is studying the biological control of cereal leaf beetle, a pest from Europe that arrived in the Tulelake area in 2013. 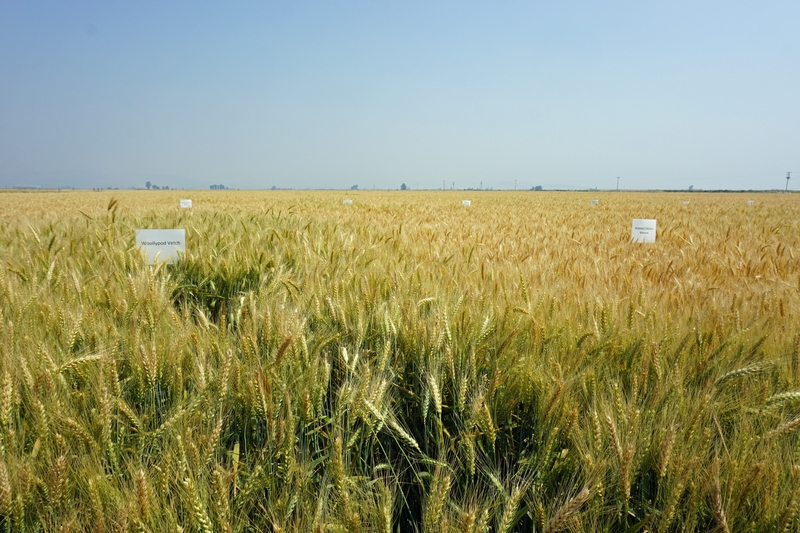 The field insectary at IREC grows parsitic wasps that he has been sampling for five years. 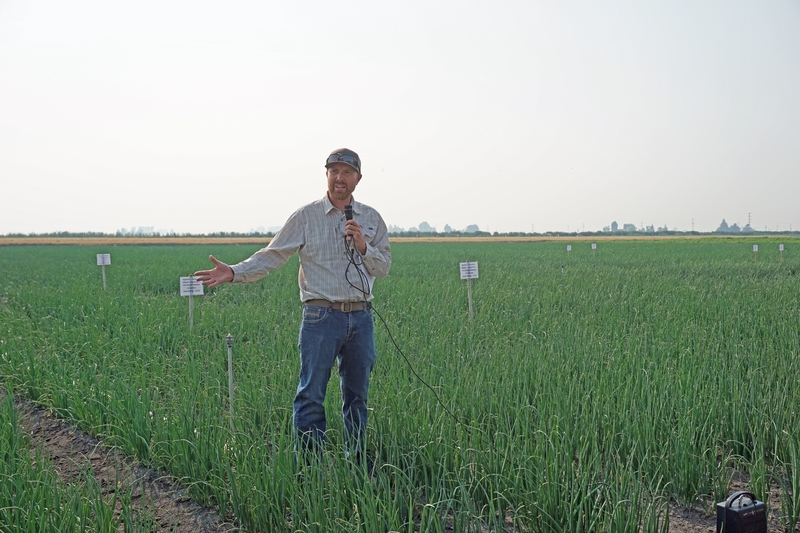 'If we didn't have that parasitoid, I can guarantee you, everybody would be spraying pesticides,' he said. 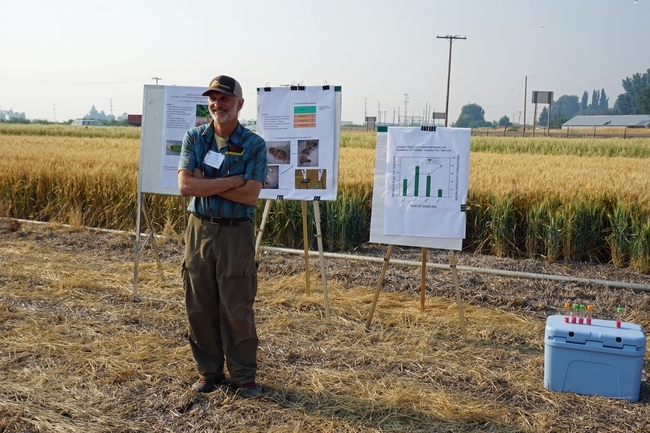 UC Cooperative Extension advisor Dave Lile is conducting research to determine the end-of-season stubble height of three hay crops - timothy hay, tall fescue and orchard grass - for ideal growth the following season. 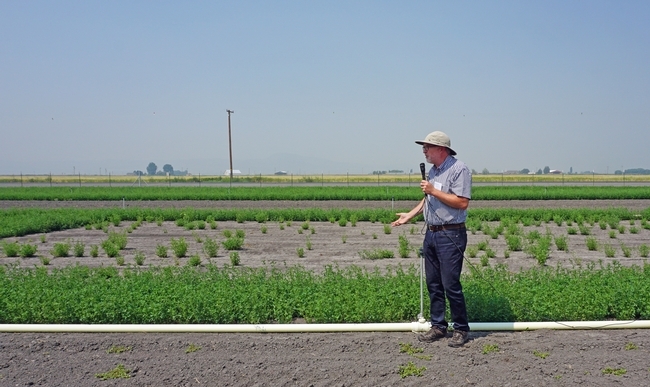 UCCE advisor Rachael Long demonstrates using a sweep net to monitor for alfalfa weevils. 'This weevil is a tough insect to control,' she said. 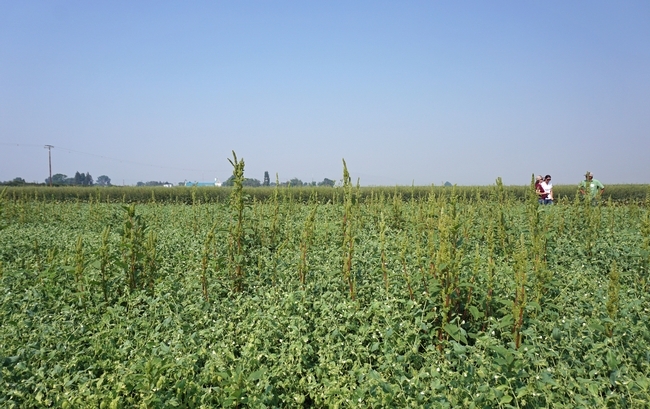 Pig weed grows though garbanzo bean plants in a weed control trial at IREC. 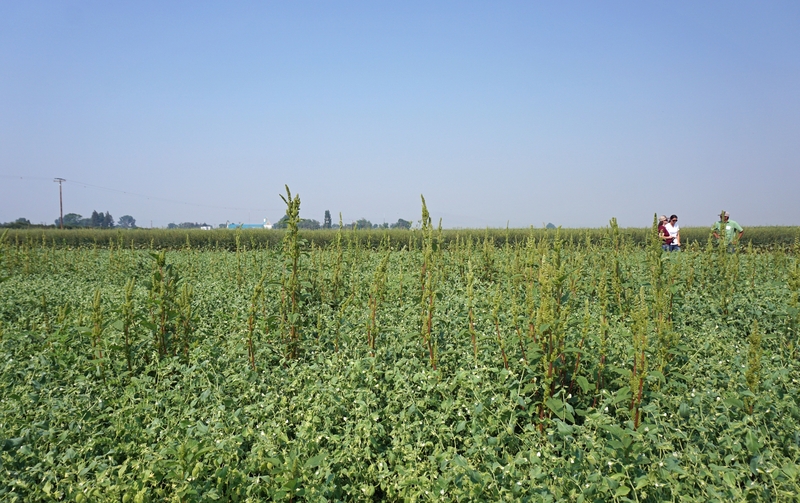 There is increasing interest in garbanzo beans as a possible rotation crop in the region. The nutritious legume is used in making hummus, a healthful snack that is growing in popularity. 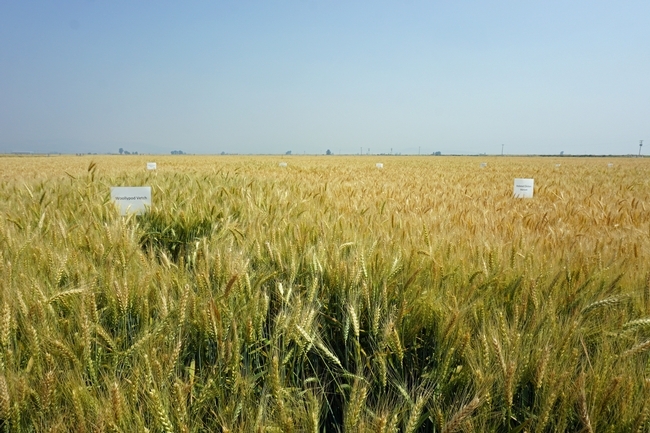 The wheat in the foreground - which followed a cover crop of woolypod vetch and then potatoes - is visibly more robust than wheat behind it that followed pelleted chicken manure and the potato crop. 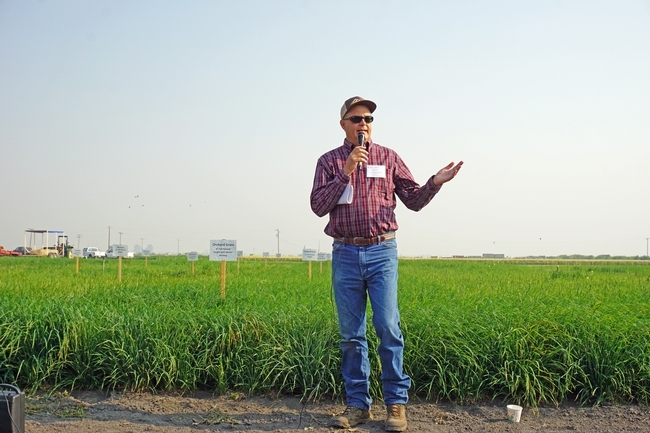 'We were surprised by the memory we get from legume crops,' Wilson said. 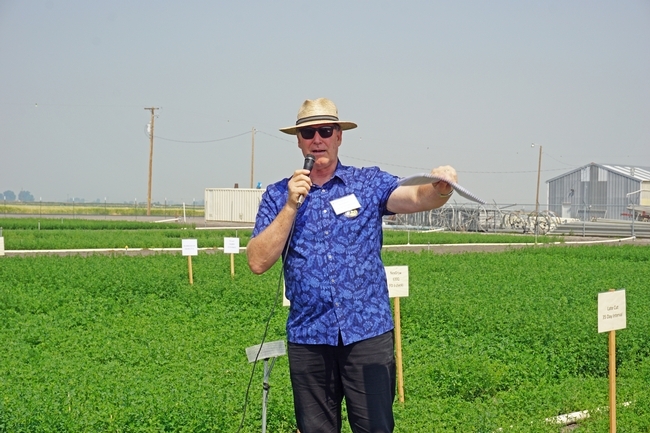 UC alfalfa specialist Dan Putnam said selecting the best alfalfa variety can result in up to $700 per acre increase in profit over five years. 'That can be pretty important economically,' Putnam said. UC Davis plant breeder Charlie Brummer is conducting pre-breeding experiments at IREC to tease out the plants most likely to parent high-yielding alfalfa.